The running plate on this loco has two extra shaped sections to clear the coupling rods whereas the Midland Railway favoured the straight raised portion. Therefore this loco has to have been built by the L.N.W.R. 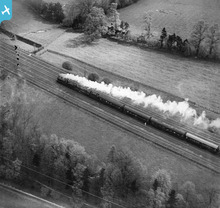 The train engine is a Royal Scot Class 3 cylinder 4-6-0 locomotive, rated at 6P. This class was built between 1927 and 30, one batch by the North British Locomotive Company and the final twenty by the LMS it own works in Derby. The distinctive parallel boiler is seen well here. In 1933 one of the class visited the Century of Progress Exhibition in Chicago, assuming the identity of 6100 Royal Scot, which, along with a bell on the front footplate, remained with engine for the rest of its working life. As is normal railway practice, the smaller engine is in front of the larger engine. The Compound is clearly steaming well and producing clean white exhaust (mostly steam) as it is not being fired at the time. We can seen both the driver and the fireman watching the 'road' ahead. The Royal Scot is also in good steam, with just a wisp of spare steam coming from the safety valve. However, the greater protection offered by the more modern cab on this locomotive makes it difficult to see the activity on the footplate. The leading locomotive appears to be one of the large class of 195, 4-4-0 compound engines built for/by the LMS between 1924 - 1932. These were based on the previous Midland compounds, with 3 cylinders being two low pressure outside cylinders and one high pressure inside cylinder. Their power rating was 4P. Sorry Maurice, but MB has it correct in that the leading engine is an ex-LNWR engine. There's evidence of a nameplate around the leading spasher too. It's clearly not a 'compound' as there are no outside cylinders, and they weren't named! More likely a kitchen (front end) restaurant car. I think you can see the white tablecloths in the windows! The concept of a buffet car was not that well formed in the early 1930s "Hampers (with pre-packed picnics) were in a sense precursors of the modern buffet car, a vehicle which did not really achieve any great significance until the 1903s and which did not really come into its own until the modern day." Jenkinson, D. "The history of British Railway Carriages 1900-1953" p 205. In addition to my previous comments on the "buffet car" suggestion of MB's, the inscription on the side is not clear enough to read, but could well be Kitchen Car (but possible equally well be Buffet Car). However the double doors between the first and second windows from the front and the amount of ventilation on the roof suggests that some serious cooking was going on in this part of the train. It is more likely to be a LMS compound (see more detailed comment elsewhere). A classic image from The Age of Steam which is sure to appeal to Railway buffs, particularly those of London-Midland-Scottish persuasion!! A view looking east-north-east towards the area south of Sherwoods Wood before the arrival of the mid-thirties suburban development of Carpenders Park. In the left foreground is the eastern extremity of the once-famous Oxhey Golf Course (1912-1952), prior to the building of Prestwick Road and the LCC estate at South Oxhey (1946-1952). The original railway lines were constructed in 1837 and the later additions came in 1913, when the Bakerloo Line was eventually extended from Willesden Junction to Watford Junction four years later. I'd hazard a guess and say somewhere south of Bushey on the main line out of Euston. The nearest pair of tracks are the Watford DC electrified lines and the LMS train seems to be on the down fast. Thanks for all the suggestions everyone, I'm happy to accept this as TQ117937 area i.e. on the main line south of the Bushey/Oxhey water-troughs. 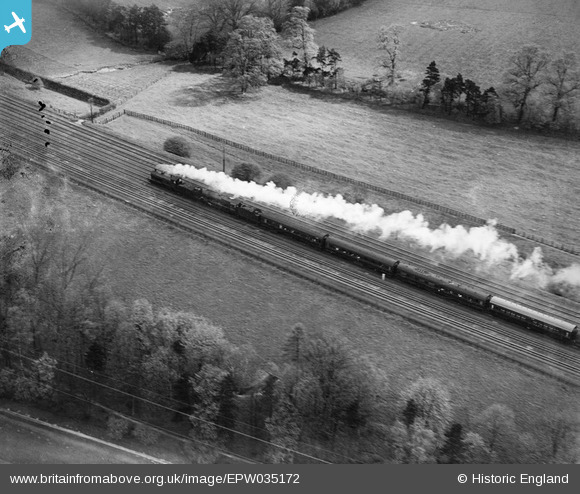 The previous images taken by Aerofilms Ltd were over Watford and Bushey. We'll update the catalogue and post the new data here in due course. To continue, is that the mile post near the end of the second carriage, in line with the second (closer) underpass? The signal post is a problem. (Map shows after second track). I think the visible post is the next telegraph pole. Possible position south of Watford heath. 1930s map shows six tracks. Also pedestrian underpass which seems to survive. The locomotives are clearly London Midland and Scottish Railway, the pilot engine appears to be a 4-4-0 with the train engine I think being a Royal Scot class 4-6-0. Judging by presence of main and relief lines and the LT electrified lines, somewhere on the main lines out of Euston to the north west of London?